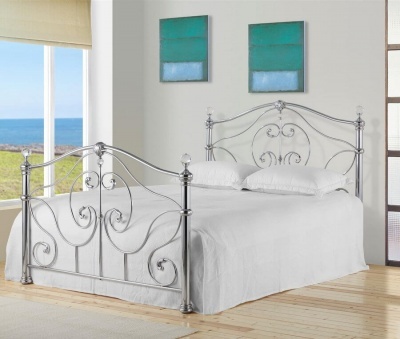 A great choice for the master bedroom, the Katrina bed has a feminine feel. Complete with a semi orthopaedic mattress for a great nights sleep. The bed frame has a sprung slatted base providing extra comfort and mattress life. Hard-wearing stone white lacquered finish that is an off white colour similar to magnolia paint. Mattress specifications: 900 gsm spring insulator pad. 600 gsm polyester filing. Quilted Belgium damask cover. 13.5 gauge Bonnell spring unit. Rod edge supports. The dimensions of the Katrina 5ft bed frame are: H110.5 W160 L210 cm. The dimensions of the Deluxe mattress are: H23 L200 D153 cm.